Planning a barbeque or family gathering during the summer months is a tradition that builds memories to last a lifetime...but what to cook that won’t bloat your waistline, and still satisfies that craving for tasty summer fare? Nothing too heavy, nothing too hot. Don’t forget to include these fresh flavors in your summer flavor repertoire for crowd pleasing results (and added health benefits) time after time. As the heat intensifies and we sweat more easily, a great way to replenish fluids is by snacking on water (and nutrient) dense melons. And don’t fret about the calorie count. It’s fruit after all, and at under 100 calories per serving you are keeping it cool and slim all at the same time. Keep watermelon cool in the refrigerator and slice it as a refreshing treat, or turn it into a decadent tomato-watermelon salad for a more grown up palate pleaser. Here in the Sacramento Valley we are lucky to have a plethora of local farmer’s markets to find locally grown melon at, so you can contribute to the local economy too! 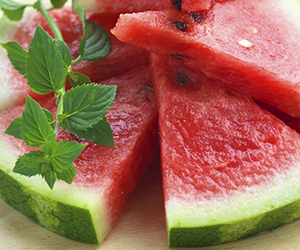 Any way you slice it, watermelon is an excellent go-to summertime snack. Cucumbers are kind of the 007 of the vegetable world. They can do all sorts of things you wouldn’t expect, from unfogging your bathroom mirror, to curing a hangover. They can even help you throw a better summer BBQ. Cucumbers contain a lot of B vitamins, so you and your guests will stay energized and alert. And as a naturally fantastic source of food derived water, cucumbers will help protect your more active guests and busy kids from dehydration. As an ingredient, cucumbers are the perfect undercover agent, subtly infiltrating almost any dish with refreshing flavor. You can add them to beverages, salads, appetizers, and even desserts, all the while sneaking healthy, energizing, and hydrating food into your summer barbeque menu. Who doesn’t think of refreshing when mint comes to mind? Altoid anyone? Menthol in mint can cool and tantalize your tastebuds, and in addition to adding zest to many-a-dish, has some noteworthy health benefits too. We’re quick to jump to fruits and vegetables when we think of antioxidants, but let’s not forget the mighty herb. Mint has one of the highest antioxidant capacities of any food, making it a powerhouse for healthy skin and cardiovascular health. A great way to add mint to your summer BBQ menu is to add its palate cleansing goodness into a beverage. Serve up a mint iced tea to your guests and help them taste the very most of every bite.